The role of the church is to spread the good news of the gospel of Jesus Christ. Every believer and member of the Church is here in their position, wherever they are, are given the light so that they can lighten others. As Matthew 5.14 says, 'You are the light of the world'. Christ is the center of our Church and its Mission. Proclamation that God (Purusha) himself came and atoned for all mankind on the tree on three nails. His redemption is freely available based only on faith in Him (Jesus) without regard to any form of karma(good or bad) and its consequences. The Ashoka Chakra is the emblem of India. We believe that the people of India are in the heart of our loving Father and and was in the mind of Christ when He was on the Cross. He died to redeem them along with the rest of the world. 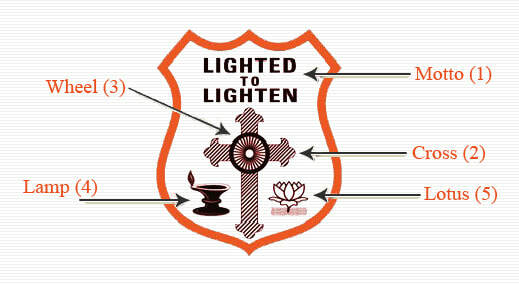 The call and mission of the Mar Thoma Church is to evangelize India. We are an Indian Church and it is a part of the Indian people both spiritually and culturally to carry the cross to Indian nation. The wheel of life is complete and closed for all those who follow the Bhakthi Marga (path of righteousness) in Jesu Maseeh (Jesus Christ). Traditionally the Chakra as presented by The Emperor Ashoka, was a symbol in Buddhism denoting the wheel of life. It denotes mans attempt to find Nirvana (Life). By placing the wheel at the heart of the Cross we declare that the life finds its ultimate Salvation in the atoning sacrifice of Jesus once and for all. Each believer is a lamp which is carried with them, which gives light of salvation for others in their daily life. Every Marthomite is a missionary, was the cry of Late Abraham Mar Thoma. Luke 11.35,36 -- Make certain, then, that the light within you is not darkness. If your whole body is full of light, with no part of it in darkness, it will be bright all over, as when a lamp shines on you with its brightness. John 5.35 -- John was like a lamp, burning and shining, and you were willing for a while to enjoy his light. So is every witness. It also points to the diligent attention to the study of the word of God. 2 Peter 1.19 -- You will do well to pay attention to it, because it is like a lamp shining in a dark place until the Day dawns and the light of the morning star shines in your hearts. Lotus is the traditional Indian symbol of holy living. As the lotus grows in the swamps, we are in the sinful world. But as the lotus flowers and stands above the water, our life should rise above the surroundings and we should remain holy in our daily life. As the lotus gives out fragrance so should our life. Lotus is part of the traditional offering of sacrifices of praise and adoration in the Indian tradition to God.